The Jupiter 869SG Artist Alto Saxophone is tuned in the key of Eb. It has a solid sterling silver neck with silver-plated brass body and gold lacquered keys. 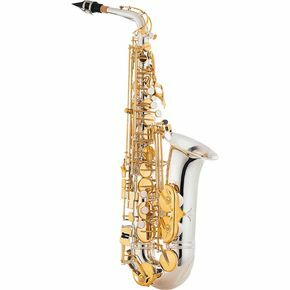 This sax is fully articulated and includes high F#, tilting Bb spatula key when C# is played, and height-adjustable bell keys. Also features metal tone boosters and a beautifully engraved bell. The Jupiter 869SG Alto includes deluxe wood frame case, neck strap, mouthpiece, cork grease, and silk weave cleaning cloth.